Winnebago were the only inhabitants in the area of Maple Grove until 1851 when Louis Gervais arrived and settled. Four years later, in 1855, city growth included a church, town hall and many homes. The Pierre Bottineau House was the first wood frame house built in Maple Grove Township in 1854. The house has been moved from its original location and is currently located in the Elm Creek Park Reserve. The city was known for its large stands of maple trees and was, therefore, a significant source for maple syrup. Maple Grove is home to a regional Boston Scientific research, development and manufacturing facility, employing over 3,000 people. Other major employers include the Independent School District 279 and the city of Maple Grove. The city is home to a 2,000-acre (8.1 km2) gravel mining area owned by Tiller Corporation and C.S. McCrossan. Active since the 1920s, the GMA is slowly being developed into a residential and commercial downtown. The first phase included Main Street, a collection of one- and two-story buildings with storefronts built in new urbanist (or neotraditional) style. The second phase was generally considered to be the Shoppes of Arbor Lakes and the third phase was the Fountains at Arbor Lakes. Minnesota's first so-called 'lifestyle center', The Shoppes at Arbor Lakes, is designed in the spirit of a mid-century American village and includes stores such as Pottery Barn, Brooks Brothers, Williams-Sonoma, GoodThings, Hot Mama, Teavana, Anthropologie, P.F. Chang's, World Market, and numerous other upscale stores. This lifestyle center was built in 2003 and has been replicated in Woodbury, Minnesota (Woodbury Lakes). Maple Grove's Shoppes at Arbor Lakes is 412,000 square feet (38,300 m2) in size and is home to more than 65 stores and restaurants. The most recent Arbor Lakes development is a hybrid power center development called The Fountains at Arbor Lakes. At 850,000 square feet (79,000 m2), this retail complex includes stores such as Costco, Caribou Coffee, Subway, DSW, Lowe's, REI and a Holiday Inn & Suites with a water park. The Fountains also includes Minnesota's most energy efficient building, Great River Energy Headquarters. Maple Grove's most recent development, The Grove, is located at the intersection of Interstate 94 and Maple Grove Parkway. This district is home to the new North Memorial/Fairview hospital complex, SuperTarget, Home Depot, Slumberland and other stores. The central portion of the project is designed to be pedestrian-friendly and encourage a small-town atmosphere within the larger scale of the development. Maple Grove's public schools are part of the Osseo Area School District 279 (see article Education in Maple Grove and Osseo), which also serves the following areas: Brooklyn Center, Brooklyn Park, Plymouth, Corcoran, Dayton and Hassan. Maple Grove Senior High School is the only public high school located within the city. Fernbrook Elementary School opened in the fall of 1988. The superintendent is Kate Maguire. A portion of Maple Grove is also served by Wayzata Public Schools. Other schools in Maple Grove include Heritage Christian Academy, Ave Maria Academy, and Parnassus Preparatory School, the other two being Private Schools. Maple Grove is located in the 7th District of Hennepin County. The commissioner for the 7th district is Jeff Johnson. Representative Kristin Robbins, a Republican (District 34A) and Kristin Bahner, a Democrat (District 34B), represent the city in the Minnesota House of Representatives. Republican senator Warren Limmer also represents Maple Grove in the Minnesota Senate. 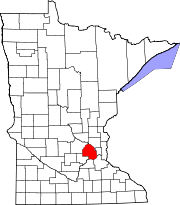 Maple Grove is located in Minnesota's 3rd congressional district, represented by Dean Phillips, a Democrat. According to a 2007 estimate,[ citation needed] the median income for a household in the city was $76,111, and the median income for a family was $89,966. Males had a median income of $52,187 versus $37,021 for females. The per capita income for the city was $30,544. About 0.8% of families and 1.4% of the population were below the poverty line, including 1.7% of those under age 18 and 2.9% of those aged 65 or over. As of the census  of 2010, there were 61,567 people, 22,867 households, and 17,222 families residing in the city. The population density was 1,886.2 inhabitants per square mile (728.3/km2). There were 23,626 housing units at an average density of 723.8 per square mile (279.5/km2). The racial makeup of the city was 86.4% White, 4.2% African American, 0.3% Native American, 6.2% Asian, 0.8% from other races, and 2.2% from two or more races. Hispanic or Latino of any race were 2.5% of the population. There were 22,867 households of which 39.4% had children under the age of 18 living with them, 64.0% were married couples living together, 8.3% had a female householder with no husband present, 3.0% had a male householder with no wife present, and 24.7% were non-families. Of all households, 19.3% were made up of individuals and 4.8% had someone living alone who was 65 years of age or older. The average household size was 2.69 and the average family size was 3.12. The median age in the city was 37.6 years. 26.9% of residents were under the age of 18; 6.4% were between the ages of 18 and 24; 28.8% were from 25 to 44; 30.7% were from 45 to 64; 7.4% were 65 years of age or older. The gender makeup of the city was 48.8% male and 51.2% female. As of the census of 2000, there were 50,365 people (10th largest city in Minnesota), 17,532 households, and 13,955 families residing in the city. The population density was 1,532.3 people per square mile (591.6/km²). There were 17,745 housing units at an average density of 539.9 per square mile (208.4/km²). The racial makeup of the city was 94.7% White 1.05% African American, 0.24% Native American, 2.52% Asian, 0.04% Pacific Islander, 0.1% from other races, and 1.04% from two or more races. Hispanic or Latino of any race were 1.06% of the populations. 31.9% were of German, 14.0% Norwegian, 8.5% Swedish and 7.9% Irish ancestry. There were 17,532 households out of which 46.3% had children under the age of 18 living with them, 69.5% were married couples living together, 7.5% had a female householder with no husband present, and 20.4% were non-families. Of all households, 15.8% were made up of individuals and 2.6% had someone living alone who was 65 years of age or older. The average household size was 2.87 and the average family size was 3.24. In the city, the population was spread out with 30.8% under the age of 18, 6.6% from 18 to 24, 34.8% from 25 to 44, 23.7% from 45 to 64, and 4.1% who were 65 years of age or older. The median age was 34 years. For every 100 females, there were 98.0 males. For every 100 females age 18 and over, there were 94.9 males. ^ "Hindu Society of Minnesota > Home". www.hindumandirmn.org. Retrieved 2018-02-02. ^ "Maple Grove Historical Sites and Displays". maplegrovemnhistory.org. 2019-02-17. Retrieved 17 February 2019. ^ Metropolitan Council (2002-06-18). "Council to work with communities on household, job forecasts". Archived from the original on 2008-06-06. Retrieved 2007-10-03. ^ "Best Places to Live 2014". time.com. 2014-09-19. Retrieved 18 November 2014. ^ "Maple Grove Lakes". maplegrovemn.gov. 2019-02-17. Retrieved 17 February 2019. ^ Jeselnik, Kevin. "FINDING ITS GROVE". Retrieved 2011-08-21. ^ "Maple Grove Mayor and Council". www.maplegrovemn.gov. 2019-02-21. Retrieved 21 February 2019. ^ a b "Maple Grove Government Center". maplegrovemnhistory.org. 2019-02-17. Retrieved 17 February 2019. ^ "Maple Grove Government Center". maplegrovemn.gov. 2019-02-17. Retrieved 17 February 2019. ^ "Maple Grove Fire Department". maplegrovemnhistory.org. 2019-02-17. Retrieved 17 February 2019. ^ "Bush Pushes Prescription-Drug Benefit In MN Visit". CBS Broadcasting. 2005-06-17. Archived from the original on 2007-09-27. Retrieved 2007-02-25. ^ United States Census Bureau. "Census of Population and Housing". Retrieved July 19, 2014. ^ "Maple Grove, Minnesota". Census Viewer. Retrieved 18 November 2018.